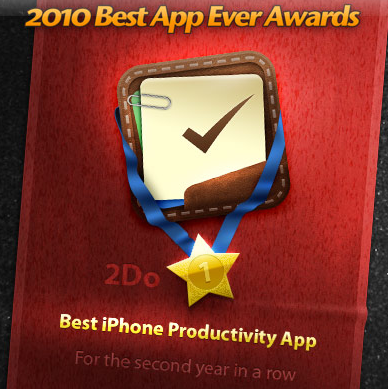 2Do a task management/todo list app for iOS has won an award from the Best App Ever Awards 2010 for the Best iPhone Productivity App of 2010. 2Do won the same award for 2009. 2Do is a Universal App for the iPad and iPhone sold for $6.99. The lite, free version, is not available anymore.